"Birds-eye view of the southern end of New York and Brooklyn, showing the projected suspension bridge over the East River, from the western terminus in Printing-House Square, New York." From Harper's Weekly, Supplement, November 19, 1870, p. 752. Engraving by Theodore Russell Davis. Publishing has been a principal industry in New York City since the early 19th century, and it remains so today-although with enormous changes to the character of the media and its production. The images on this wall present a history of the vast technological, economic, architectural, and urban transformation that affected the city and the newspaper business in the decades from 1870 to 1930. 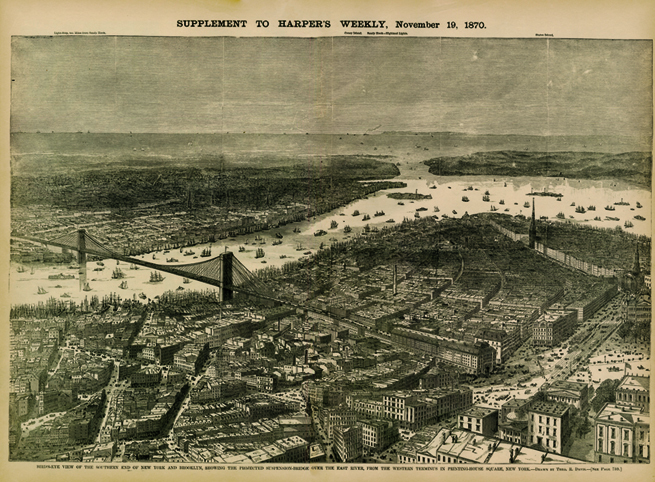 The birds-eye view of lower Manhattan above, published as a supplement in Harper's Weekly, November 19, 1870, sets the stage, picturing New York in its last years as a low-rise city. Seen from just north of City Hall Park, the engraving depicts a densely built metropolis of a uniform height. Only the steeples of St. Paul's Chapel and the distant Trinity Church, accenting the highlighted diagonal cut of Broadway, along with the ships' masts and shot tower near the drawing's center, interrupt the homogenous horizontal blocks of the five- and six-story city. The impetus for the engraving in this popular national magazine, published in New York, was to envision the transformative power of the projected East River (Brooklyn) Bridge that had begun construction in January 1870 and would be completed thirteen years later, in 1883. This unusual aerial view looking south imagines the future transportation hub at the new center point of the city at Park Row and Printing House Square.